Welcome to our Signature Gold Coast outdoor event! Its exhilarating, action packed and set to test your team to the edge.. The “Signature” Treasure Hunt involves your group broken into Teams on the day we call them “Crews” of Pirates with their goal to be the first crew to not only locate the Chest but open it as well. The Crews will be armed with maps and clues at which they will travel to locations to complete Cutthroat activities which will award them clues to the location of the chest. The Crews will need to work smartly and quickly to outwit their opposition crews and beat them to the chest. This signature event can be facilitated on foot around your conference location or the true Signature event offers crews hire cars or Mini buses and sees them travel around the Glitter strip and utilising the beaches, parks and local tourist attractions. This event offers some great WOW factors however depending to budget we can really spice the event up with Jet boats, Harley’s, Bicycles and Kayaks. 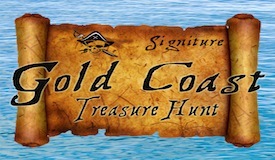 Find out more about our Gold Coast Treasure Hunt program and its pricing, request a free quote today!